Iraq's security situation has deteriorated in the past year, its courts are in worse shape than before the war, and its electrical system is not meeting targets, Congressional investigators say in a report that outlines the challenges facing the new sovereign government. In addition to the findings by the General Accounting Office, the inspector general of the Coalition Provisional Authority on Tuesday released reports citing management problems. And a private group says the estimated 7 million to 8 million small arms in Iraqi hands could pose a regional threat. The former chief U.S. administrator in Iraq, L. Paul Bremer, tells the CBS News Early Show that Iraq will succeed as a democracy, but not follow the U.S. model. "It will certainly be a pluralistic society," Bremer said. "It will not be an American-style democracy. It will be Iraqi-style. I think it will be a successful country and quite an example for other countries in the region." 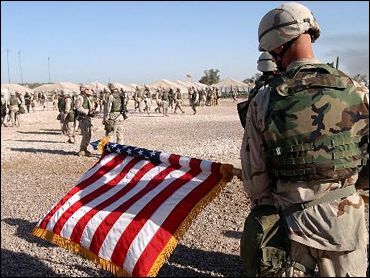 Insurgents fired at least 10 mortar rounds at a U.S. base on the outskirts of Baghdad International Airport on Wednesday, wounding 11 soldiers, two of them seriously, and starting a fire that burned for well over an hour. The United States turned Saddam Hussein and 11 of his deputies over to Iraqi legal custody on Wednesday. An inquiry into the quality of Britain's prewar intelligence on Iraqi weapons will publish its report on July 14, the government announced Wednesday. The Times of London said the findings could pose more trouble for Prime Minister Tony Blair. The U.S. Army has reopened investigations into two prisoner deaths in Iraq that had previously been attributed to natural causes, an official with the service said. New information led investigators to question the causes of the deaths, the official said, speaking on the condition of anonymity. For the first time in more than a decade, the Army is forcing thousands of former soldiers back into uniform, a reflection of the strain on the service of long campaigns in Iraq and Afghanistan. Army officials said Tuesday that about 5,600 former soldiers — mostly people who recently left the service and have up-to-date skills in military policing, engineering, logistics, medicine or transportation — will be assigned to National Guard and Reserve units starting in July. The U.S. military has changed the status of a Marine in Iraq from "missing" to "captured." In a videotape shown on Arab TV Sunday, militants threaten to behead Cpl. Wassef Ali Hassoun, a Marine of Lebanese descent. The New York Times quotes a Marine source who says Hassoun had deserted and was trying to make his way back to Lebanon, after seeing a comrade killed by a mortar. The General Accounting Office found that the CPA has spent only $8 billion of the $24 billion in U.S. funds at its disposal, and $15.5 billion of the $21 billion in available Iraqi funds. "The capability to track the total amount of bilateral assistance flowing into Iraq and to identify sectors that do not receive assistance is still under development," the report found. The GAO cited widespread problems with the Iraqi security forces, reporting that, "the security situation in Iraq has deteriorated since June 2003, with significant increases in attacks against the coalition and coalition partners." "Anti-coalition attacks have generally become more sophisticated, widespread, and effective," the report found. While "ongoing efforts have begun to establish a functioning independent judiciary," the GAO says it learned that "courts are not at their pre-war capacity." And while power generation has improved in the past year, the progress was not fast enough to meet the CPA's goals and "electrical service in some areas is worse than it was before the war." The GAO blames some of the reconstruction programs on inadequate staffing at the CPA. But the biggest obstacle, the congressional auditors found, was security. Bremer said ending violence is the top job of the new government. "They must get security down to a level where the violence allows them to go forward with elections in January. I'm confident they will," he told the Early Show. "These people want to control their country. They want to stop the violence, and I'm confident that with our help, they'll be able to do that," he said. Besides the mortar attack Wednesday, a car bomb exploded outside a police headquarters in Samawah. Elsewhere, police in the southern city of Basra on Wednesday defused a car bomb targeting a parade of 1,000 officers from various branches of the security services, said Iraqi Police Intelligence Capt. Jassim Mohammed. Despite the end of the occupation, about 160,000 foreign troops — most of them Americans — remain in Iraq to provide security and train Iraq's new security services. American officials have warned that the transfer of sovereignty would not stop assaults. According to a study published Wednesday, the huge numbers of small arms left behind by Iraq's armed forces after the fall of Saddam Hussein could cause instability in the Middle East for years to come. "Millions of firearms suddenly flooded a chaotic social landscape," the 335-page Small Arms Survey said. The number of murders using firearms in Baghdad rose dramatically and "the violence became a major barrier to the restoration of legitimate authority." The Iraqi people currently control an estimated 7-8 million firearms, although the actual number could be much higher, the study said. This makes Iraq "highly but not exceptionally well armed," and it still has fewer firearms per person than countries such as Finland. "The concern here … is we do not know what proportion of these weapons are military style," Keith Krause, the program director for the survey, told reporters. "Iraq now poses a regional proliferation risk."